Alexandra Berger-Polsky, originally from Upstate New York, is currently pursuing an MPH at Ben Gurion University while working at Sidreh, a Bedouin women's empowerment non-profit and weaving collective in the Negev. 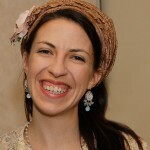 She has nurtured her love of reading Torah, Haftarah and leading davenning since her bat mitzvah. She currently lives in Jerusalem with her husband Nadav.